This is week 3 of the 2018 New Quilt Bloggers Blog Hop. Have you read all the exciting introductory blog posts in the past weeks? What wonderful quilting stories out there. If you have missed them then click on the Happy Stitching Team button on the right of my blog to catch up. I originally hail from Kenya. Growing up in the 70/80s was an amazing time in Mombasa. Mombasa is a coastal town in Kenya with Arab/Portuguese influence. Its known for its beaches and the slow pace life style with lots of family and community interaction. Of course, the world has caught up with Mombasa so things have changed. But having said that Mombasa at heart is the same, warm, casual and fun. Ever since I remember I have loved to sew. It was my happy place. This was all nicely supported, as I had my maternal aunties who ran a Garment’s factory and had access to so many fabric off cuts. At first I used to make my own clothes then my friends wanted me to make them hip new clothes. All this was formalised by studying at Home Science College, majoring in clothing and textiles. By the age of 19 I was running a creative small business making traditional clothes for women in our community. The clothes were embellished by hand embroidery, hand painting or applique. My business was going well as it grew from my passion of creating beautiful clothes. Then I met my husband and travelled all the way to Australia to start a family. I never dreamt that one day I will be living in the land down under. It was just destiny. Today I live in the beautiful city of Canberra. Picturesque and peaceful. Lots of active and creative places to go to. This is also the home of my guild the Canberra Quilters. The Canberra Quilters put up an annual exhibition every year in August. The calibre of quilts are to envied. In Australia, I was introduced to the world of quilting. I was amazed when I saw art quilts and how they looked like paintings except they were made with fabric. I then purchased my first computerised sewing/embroidery machine. The Husqvarna Designer SE, which I still use. I bought it for its embroidery function, but soon I got sucked in to the world of quilting. I desperately wanted a quilt for myself and could not just settle to buy one. Coming from a creative background, I had to learn this art for myself and make it for myself. So I did my first quilt class in 2004 with a local quilt store and made my first quilt “Healthy Living“. My second quilt was from a pattern designed by “Julie Wallace” of Quilter’s Barn, I made the Winter Rose. Sad to say that she is no more. When I first started quilting I thought of joining my local guild, but working full time and raising a family, It was impossible for me to attend guild meetings. Searching online, I found this fledgling quilting group based in India, the Desi-Quilters back in 2006 or so. From a handful of quilters, it now boast’s group membership close to 3000. This got me into blogging about my quilts although if I see some of my earlier posts I feel like deleting them but then I thought that at least it can be a testament to how far I have come. Quilters in India have come quite far and are now going to have their very own quilt festival – The India Quilt Festival 2019. 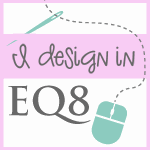 I design my quilts using EQ 8. I am not sure how I got into buying the EQ software, but I have had it since EQ 5. I hardly used it for many many years, then at one point in time I got thinking that I want to do something more with my quilts so I talked to a friend who is a copy writer in Sydney, asking her to design a website for me, however she was very gracious and encouraged me to start a facebook page, hence No3quiltstudio on facebook. Through this page Husqvarna India saw my quilts and was invited to take part in an online quilt competition in 2015. The theme of the quilt show was “Joy of Flowers”. I was not sure how I was going to achieve this, then with the help from my son I designed my quilt inspired by a photo taken by my husband. At that time I did not know my EQ software very well so I designed the entire quilt on paper! My entry of “Joy of flowers” won a Pfaff Passport 2.0. I was elated! Following that, I showed my quilt to an online quilting friend who worked for the Australian Patchwork and Quilting Magazine. She loved the quilt and offered to show it to her magazine editor. The editor liked it and wanted to publish my quilt which then forced me to design the entire “Joy of Flowers” quilt on the EQ, just so I could give them correct size templates. I mainly love the designing aspect of quilts and quilted projects. My main goal is to keep designing quilts, sharing and connecting with other quilters all around the world. I can’t believe how giving quilters are and that is the main reason for the growth of this industry. So keep sharing with love! I never in my foggiest dreams thought that one day I will be quilting or inspiring people to quilt. Having an online presence and working on something I love has helped me grow as a quilter. By having all information at my fingertips I can challenge myself constantly to try out new quilting techniques. I strongly encourage anyone who is new to quilting take a beginner quilt class. Join your local guild and if you are time challenged, join facebook quilting groups or just do an online course. Keep on playing with colours and sketches to come up with a quilt or simply purchase a quilt pattern from numerous designers and make it your own with your choice of fabrics or by adding some embroidery or applique to it. It’s that easy! Talking about playing with colours and sketches check out my Exploring Colours for Quilts series. At the moment we are on Challenge 1: Exploring Primary Colours. Do check it out and join my linky part. Also check out my Beginner Quilt Lessons this is my way to give back to the online community as it has been nothing but generous. What did your first quilt look like and where did you learn how to quilt? Let me know in your comments below. Please visit all these blogs. You will love it as each of these quilters are super talented! I would like to thank the co-hosts for the 2018 New Quilt Bloggers Blog Hop, Beth at Cooking Up Quilts; Jen at Dizzy Quilter; Tish at Tish n’ Wonderland; and Sandra at mmm! Quilts. To be eligible for the giveaways, you need to visit their each of their blogs and follow the instructions to enter to win a giveaway. My first quilt was a patchwork style quilt where I put several squares together for my first baby. I hand quilted it even if the stitches were more like basting. Oh my, my favorite country in the world (well, next to Canada where I live, of course!) is Kenya! I cannot wait to get back there. Amazing county! My first quilt was a baby quilt for a friend. I learned using a quilting book. It wasn’t perfect, but the piecing was decent. The quilting was passable. They loved it, which was the important thing. I have yet to be able to take a class, but look forward to doing so. I am so grateful for bloggers and youtubers who so willing share their knowledge…it has helped tremendously! Hello Rashida, nice to meet you wow exciting time growing up in Kenya and then being able to live in Australia. I do a lot of patchwork quilting. But do love paper piecing! I am actually trying to hand quilt my for the first time now. Won’t be no showpiece but love the look. interesting post Rashida, and nice to meet you. Like yourself I have found the quilting community both generous in their time and their skills. Looking forward to reading you again. Hi Rashida, What a wonderful story about yourself. It seems you are a very busy lady. I am interestes in possibly purchasing EQ8 in the near future so I may try to design my own patterns. Well hello! A fellow Aussie! It looks like you’ve done some great work and I look forward to seeing more of your quilts! Hello, love your quilt projects! Love your History too! Thanks for sharing! My first quilt was a triple rail in pale colours. I played a bit with quilting at home and then took a course at a shop that sold sewing machines. I look forward to more of your posts. Hello Rashida! This is Tracy from It’s a T-Sweets Day! I’m so glad to get you know you a little bit better. How wonderful to quilt from Africa to Australia:) You are a world quilter for sure! Enjoy the blog hop:)! I started sewing when I was 8. My 1st quilt was made from green and yellow 4 inch squares. All 114 green squares were embroidered by hand with the pictures coming from coloring books. I made it in 1970 for our oldest daughter. It was twin sized. My first quilt was pieced of cut up old clothing and sheets and scraps. Technically, it’s not a “quilt,” because once I had it pieced, I needed to move on. I love your story!! What a wonderfully creative journey you have had! I’m trying to imagine 3000 members- wow. I bought a book and taught myself in 1990…so happy I did! Thank you for sharing. Very fun to hear a bit about life in Kenya and Australia. I love getting a glimpse into other people’s lives around the world. I learned to quilt 30 years ago with a friend. She suggested we take a beginner class at a local quilt shop–it was a six-block sampler made entirely by hand. I’m so glad the rotary cutter was invented or I would have never made another quilt. By the way, your designs are wonderful! Hi, Nice to meet you! You’ve lived in many interesting places. I wrote about my first quilt on my blog. It was the second post I published two years ago. It was blue and white and was filled with nylon stockings. I didn’t have enough stockings on my own but enlisted the help of others which resulted in my receiving jewelry, love letters and a proposal of marriage which I declined. I don’t have that quilt anymore but sure wish I did. I guess you’ll just have to pop on over to my blog to read about it to find out what happened with it. Comment you first quilt was hand Peiced. It was a patchwork quilt made with remnants from my Gramma’s clothes sewing. What did it look like? I can’t really remember because I was 10 at the time. Sadly it didn’t survive my childhood. I loved it to pieces……..literally! So fun to read your post and learn more about you, Rashida. You have had a fascinating quilt journey so far. I don’t have EQ8 yet, but plan to order it soon. My first attempt at a quilt was a placement set from a pattern I found in a magazine. It looked simple, but didn’t go together well. I sent the whole thing to my mother, who discovered a mistake in the pattern. I quit attempting to quilt for awhile after that, but picked it up when my kids were young. Wow! That’s quite the quilting journey you have been on! Fun to read about! The first quilt I made and actually quilted myself was two years ago. A little baby quilt. Most of my projects have been small. My very first big quilt was a chevron and heart quilt that I finished in January 2017 that was requested by a cousin for her first grandchild. I wrote a post about that entitled MY FIRST BIG FINISH! What an exciting day for me! I still consider myself pretty new to quilting since I have very few finishes. I sure do love it though. I first learned to sew in 4-H club and was taught by my Mother. At first I sewed clothing for myself and my children (and even a tailored jacket for my Husband taught by a Home Extension agent.) It was later when my parents were to celebrate their 50th Wedding Anniversary that my siblings and families all decided to make them a celebration quilt. I headed the design with each family member choosing colors for an appliqued butterfly which they or their family member completed–they each also had their embroidered signature on the block. I pieced it together with blue sashing and border and a family friend hand quilted it. It was a happy surprise for my Parents! Comment Hello Rashida, I enjoyed reading your post. It sounds as if you have had fabulous quilting experiences from the start and have great stories to share, as you want, on your blog. Art quilts are one technique that I have never tried. The first quilt that I made was a scrap blue log cabin lap sized quilt for my Mother. She still has it hanging over the back of her recliner and uses it quite often. Thank you for sharing your fabulous introductory post. I enjoyed it a lot. I learned how to quilt by taking online classes on Craftsy. My first quilt was a checkerboard baby quilt made of charm squares that I made for my son who has yet to arrive. It looked … not good, but it started me on this crazy amazing journey! Wow that was over 60 years ago so who knows what it looked like. My Grandmother taught me. I think it was a 4 patch. I think my first quilt was only 2 layers, made out of dress fabrics from my Mum’s and our two daughters off cuts. It is still used as a picnic rug. My first real quilt is still in blocks, waiting to be finished, started in 2006, so a 12 year gap to mature in the cupboard. You have travelled, and excelled in all quilty things. great to know you are really just a hop across the water from me in NZ. Hi Rashida, I started sewing home dec items about 30 yrs ago. I got into quiting while looking for projects that took more time to complete than table runners and placemats. So I decided to make a quilt – queen sized! A neighbor gave me some quilting books and off I went. Did 1/4″ quilting around the stars on my 1933 Singer and was hooked. Brought a Bernina a year ago to make it easier to quilt and now am learning FMQ and ruler work. Just love it! My sewing room is also my Happy Place. Hi Rashida: It’s nice to meet you through this hop. I learned to quilt at my local quilt shop which sadly is now closed. I made my first quilt for my nephew who requested a handmade gift. I’ve thought about getting EQ8 but I use older computers and I’m not sure how it would work with them. Also I’m still working and cant imagine having the time. Hi Rashida! Thank you for sharing your fascinating quilting story. I learned to sew in home ec class in high school, and I made my first quilt out of corduroy scraps left over from a jumper and pants that I made. I got hooked on sewing scraps together, and became a quilter rather than a garment sewer. Lovely to learn a little more about Kenya, and see your lovely, colourful quilting. I’ve only been quilting about 4 years, but have been sewing as far back as I remember . . . even before I was old enough to be allowed to use the machine – all crafts make me happy! Greetings from Canada! Unfortunately, my very first quilt is not fully completed. And, quite frankly, I don’t like it. My piecing was not 1/4″ and I hand-quilted about 1/2 of it. It is not nice quilting fabric and I guess, I just don’t want to finish it. I love quilting now and have made a few quilts since that first one. Thanks for the wonderful post! Hi Rashida! You’ve had a very international quilting journey! My quilting journey happened in different countries, also. My first quilt was a fan quilt and I figured it out from a photo in a women’s magazine. Thanks for sharing the story of your fascinating quilting journey. So lucky you came to quilting, and that you love to share your ideas with the rest of us. I have yet to finish my first quilt. It was started at a beginners’ quilting class but is supposed to be hand quilted. I have no patience for handquilting, so it languishes in my UFO pile. My college had a craft center and one of the classes was quiltmaking. I made my first quilt through that class, where we each picked our own pattern. I fell in love and have been quilting ever since! It has been nice to “meet” you, and to learn more about your quilting journey! My first quilt was a hand-quilted “Sister’s Choice” block, blue, purple, and cream background. The purple bled the first four times that I washed it; made me scared to use purple or red for quite a long time. I love hand quilting, but love finishing projects even more so I usually quilt with my machine instead. I learned to quilt originally from my grandmother as a young child, but life got in the way and I quit quilting for a long time. One day I bought a book by Eleanor Burns called Log Cabin in a Weekend! Well, I pieced it, though it took a little longer than a weekend! LOL It’s still in my closet after oh 30 years or so to be quilted! I took a quilt class at a local shop shortly after that and we hand pieced a small wall sampler. It is actually quilted – by hand! It did take a while to do that and I don’t think I would do it again!! I enjoy my longarm too much for hand quilting! Wonderful advice, and a wonderful post! Technically, my first quilt was a wholecloth baby quilt that I quilted very simply with a walking foot when I was expecting my daughter in 2002, but I didn’t really learn to quilt until 2011, when I took a class at a local shop. That was when I made my first patchwork quilt–nine patches and variations in turquoise and orange and white. I gave it to a couple who had just had their first baby. Such lovely words. Really an inspiration. So nice to meet you!! What a great cultural heritage you have!! My first quilt was a small homespun churn dash that I hand quilted. I know I still have it–but have not located it since we moved–might have to do some searching this week!! My first completed quilt was for my son made by embroidering (by hand) nursery rhyme blocks and setting it together with lattice and a border (an ugly yellow fabric) then tying all the layers together. My son still has this quilt. the inner layer is a sheet blank that my mom was recycling. She used to recycle electric blankets too by pulling out the cords and then tying them into quilts. The blankets, not the cords. Wonderful to get to know more about you! Wow, winning a sewing machine must’ve been QUITE the high! And then all the publications–! I especially like Table and Chair, so unique and interesting! Good for you for learning EQ. I had 3 did a little with it, but full-time work which was more than full-time (teaching) and raising young ones did not leave time. I bought EQ8 and am very happy with the mostly user-friendly (I’m a Mac girl) programme. My first quilt was one I hand-sewed for my Barbies, stitching little pillows 1/5″ square, stuffing them and stitching the little pillows together. I still have it. No one quilted in my family, so I clearly was a quilter in my previous life. Comment yes first quilt was very “country” with an appliquéd heart on each square, 4 rows by 4 rows. Lots of mistakes! I am a self taught quilter, but had been sewing about 25 years before that. My first quilt top was a feathered star Christmas tree skirt. It is still unfinished, as we stopped decorating for holidays. My next, finished, quilt was a triple irish chain. Still use it. Your quilting journey has taken you far already! It’s been fun reading about your experiences. I guess I kind of learned to quilt on my own with help from my quilting mother-in-law. I made my first quilt after she passed away from blocks that she had pieced. It was pink and green. My first quilt was an Irish Chain for my yet to be born nephew. My sister-in-law was such a wonderful inspiration and incouragemwnt. Her quilts were beautiful and she did everything by hand, piecing, quilting, binding and it was all done to perfection. That was back in the early ‘80s. I’ve progressed since then but have never mastered hand quilting. My sister-in-law passed away last year and I miss her terribly but I still enjoy piecing my quilts and hope someday to be able to master FMQ and ruler quilting. My first quilt was a disaster. But since then I am being taught by a quilter who has been quilting for over 50 years and now is a beloved friend. I am learning to machine quilt…it is so exciting!! Commented love to travel to Africa one day. It’s a beautiful country. My daughter came home from spending two years in Kenya just last August! She talked often of Mombassa. She lived in a compound called the Tania Rehabilitation Centre and taught English, Music, Physical Education, and Computer. This year she also had the dog she raised from a pup brought over from Kenya! I’ve always wanted to tour Australia ever since doing a report on the continent when I was in 6th grade. I won’t hold my breath that it will ever happen, but I can dream! 🙂 Love your blog!! Thanks for sharing!!! Loved you blog! My first quilt was a multicolor Star. Such a great tribute to your career. Very interesting life! So fun to see your quits & designs. Hi Rashida, it was great to read about your journey about quilting and the experience you had. Am so lucky to meet you and am enjoying the quilting we do together.Love all the designs you have made and all the best. My first quilt was sewing some nursery squares together. Very plain but my daughter loved it. Thank you for sharing your interesting story! I really enjoyed it. Lovely to meet you and read about your journey; it is so inspiring when you discover something you love. I will keep an eye out for your patterns….they look lovely. I first learned to quilt at beginers quilting class . And truly love it, my passion just keeps growing more and more. You truly had a great journey I envy you . To have had such a exciting life hope to learn more and more from you.